The black bull on an NRA B-8C(P) 25 YD REPAIR CENTER target is 5 1/2" diameter. 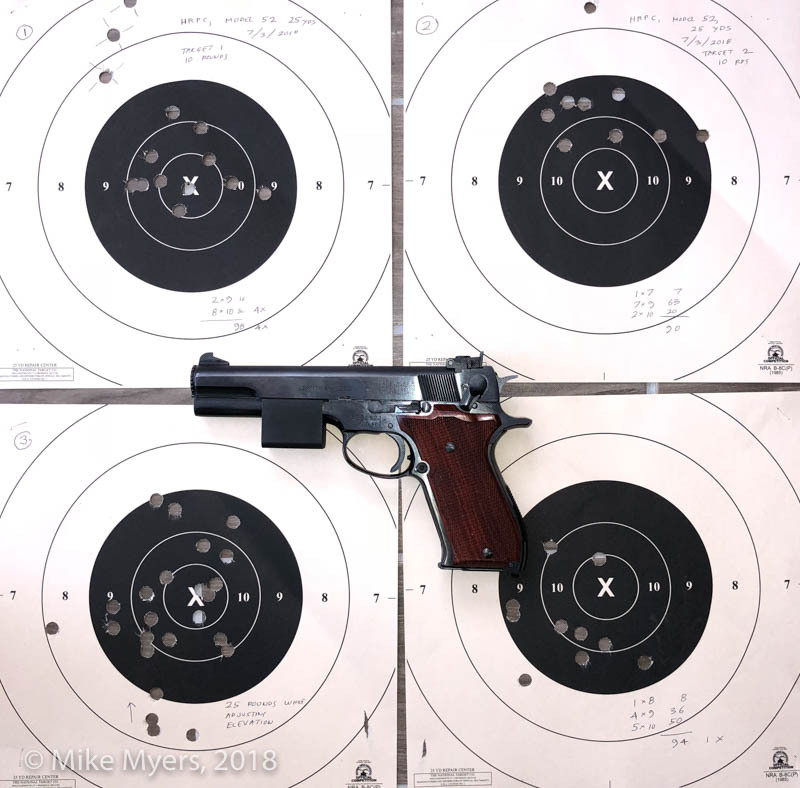 Starting with a S&W Model 52, sighted in for the center of that target, would anyone here know the math involved to change the sights to a sub-6 o'clock hold? Ether how much the POI will move down at 25 yards for each 'click', or how many turn(s) to adjust the elevation screw CCW (up) to raise the POI half that diameter (2 3/4") would be helpful. I'm assuming that since a sub 6 o'clock hold is what so many of you recommend, there is enough travel in the sight elevation adjustment to accomplish this. 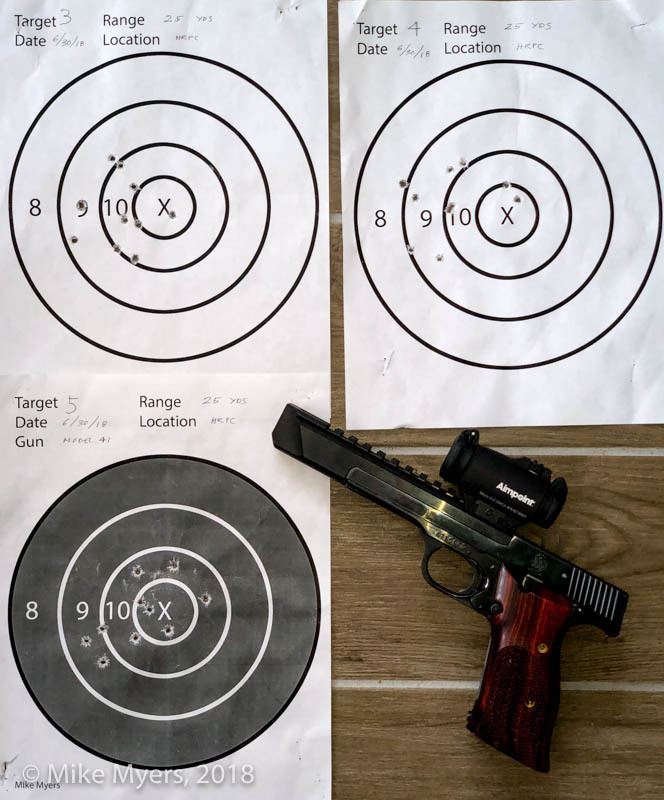 "most handgun rear adjustable sights are 1 MOA meaning one click changes the elevation or windage 1" @ 100 yards. If you are sighting in at 25 yards, you need 4 clicks = 1 inch. " If that is a reasonable starting point, I could start by turning the elevation control 11 clicks CCW, which means I should probably turn it 12 clicks to gain a little white space between the top of the sight and the bull. The formula above has to be dependent on the barrel length, so I realize this might just be a starting point. I expect to get to the range tomorrow, and will start out with whatever seems to be a reasonable estimate, then go from there. You might be over thinking this. Take it to the range. Shoot it. Crank it up till it prints in the center. Looking at what you were shooting the other day you might want to crank it right a little also. Len.. Remember there should be as many holes to the right of center as there are to the left. And as many holes above center as there are below. Len, I overthink everything. That's me, the way I do things. It's hard for me to change, as my brain is always running on "overspeed", and therefore missing things too. Anyway, I did as you suggested. I did the 13 clicks CCW, and then started shooting, re-adjusting things after every 10 rounds. First target - I also tried gripping the gun harder, which totally messed up everything. After I went back to holding the gun normally, I got target #1 below. Target #2 also was too high (the shot heading for Saturn is totally my fault - something "twitched"). So, I lowered the POA, and got target #3 with several holes too low. I corrected for that (one click) and got target #4 which is still too low. So I re-adjusted the sights one more click, and fired 15 more rounds at target #3, so now it's 25 rounds at two different elevation settings. I will say one thing for sure - maybe I'm not shooting as well as the rest of you guys, but the idea of a sub 6-o'clock hold certainly tightened the group up. How many thousand times did you guys need to tell me that last year before I changed my Les Baer. Well, my M-52 is now close to being set for this target, at 25 yards.